Woke up this morning after a good night's sleep despite getting kicked by the boy a number of times because the hotel does not provide baby cots. The first thing I did was make a trip to the onsen (but of course!). 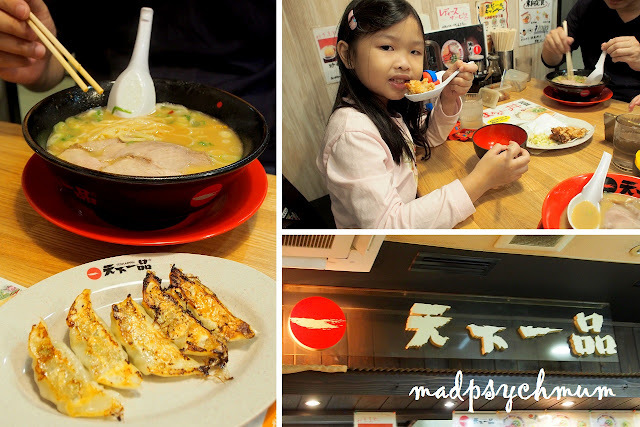 As our room did not include breakfast, we had our brunch at Yayoiken (we have this in Singapore too!) just down the road from our hotel. (they should totally have this in Singapore!). The kimchi seafood set for my mum-in-law as she doesn't eat beef. 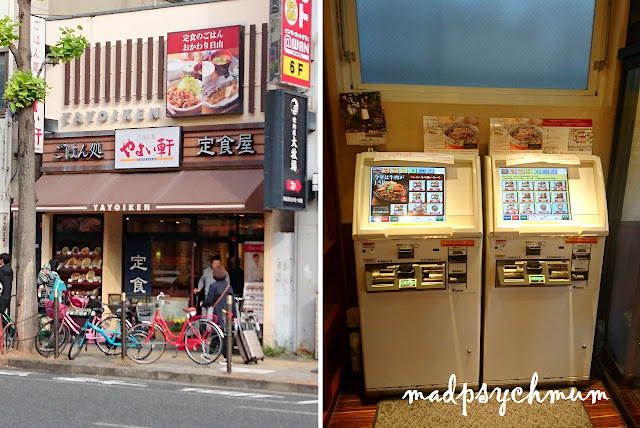 After our brunch, we took a short 5 minute walk to Nippombashi Station, the nearest station to our hotel. We were informed by the staff to go one level down to the Kintetsu Railway to take the Kintetsu Line to Nara. 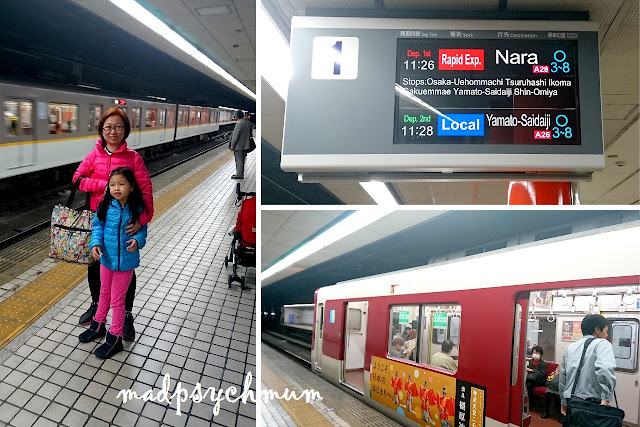 The nice thing about this station is that you can take the Rapid Express Train directly to Nara Station (do wait patiently for it as it's a lot faster). If you are in doubt, ask the Service Manager, who is stationed at Nippombashi Station around the area where you purchase your tickets, for help. They are able to speak both English and Mandarin and are very helpful. The Service Manager was the one who told us which train to take and what time. She also told us how much it cost (560 yen per adult and child, one way) and how to pay for it using the ticketing machines. It was our first time so it was so useful having someone help us through it. The knowledge I learnt helped me with using the ticketing machines myself for the rest of the trip, especially when there was no staff available to help. The Rapid Express train that we took to Nara. It took us approximately 40 minutes to get to Nara Station. It didn't feel long at all since we got to watch the beautiful scenery as we passed by. 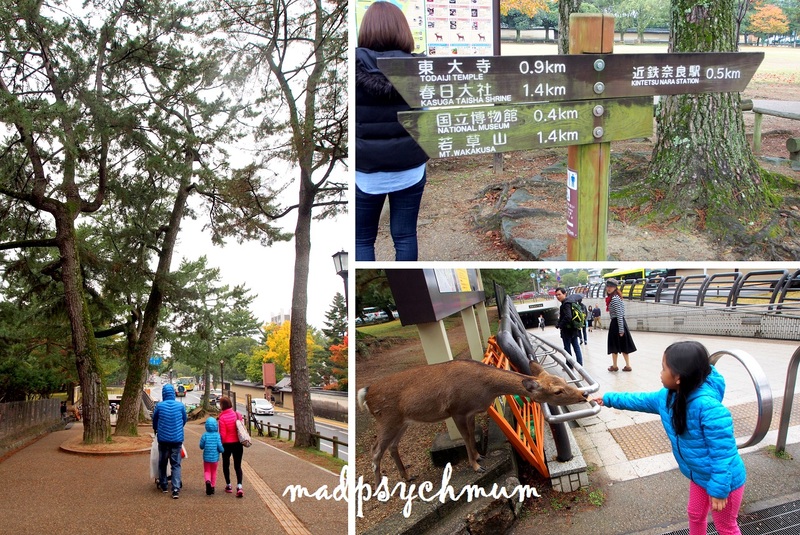 As you can see, deer are literally everywhere in Nara: it is their mascot, it's in their posters, it's on their roads and signboards... everywhere! 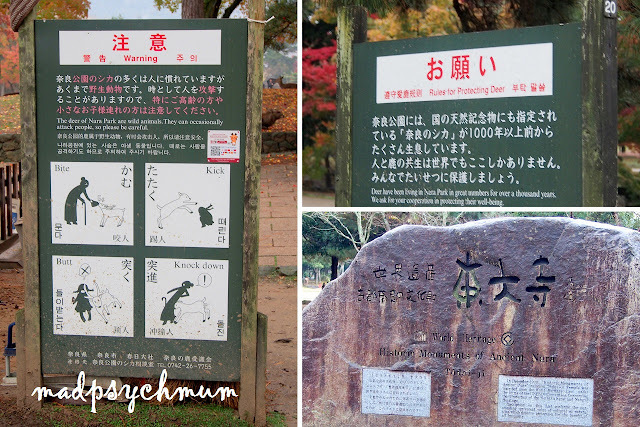 We headed straight to Nara Park, which comprised of several smaller parks (you can find your way easily using Google Maps). 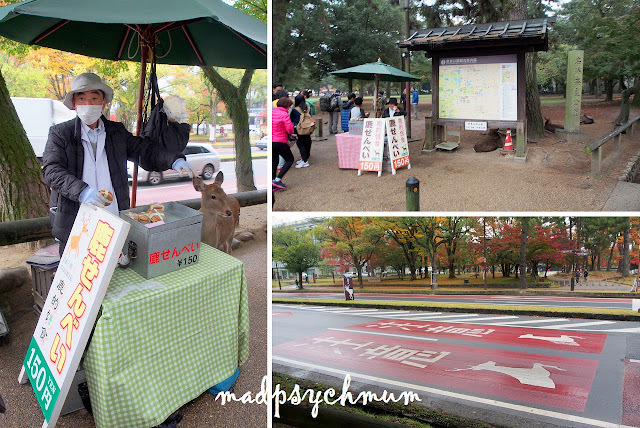 Clockwise from left: A man selling deer food for 150 yen each. It's the same price across the sellers. Signs on the roads warn you to be careful of deer crossing. 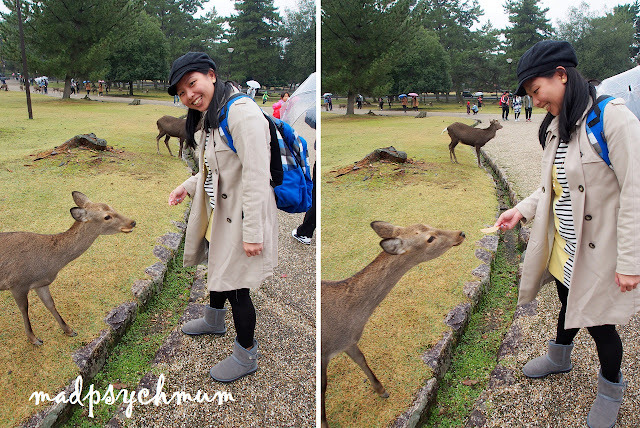 The main purpose of travelling all this way to Nara was to feed the lovely docile deer that freely roam the park. As long as you keep your respectful distance and not scare them, you should be ok. The deer here are very used to humans. 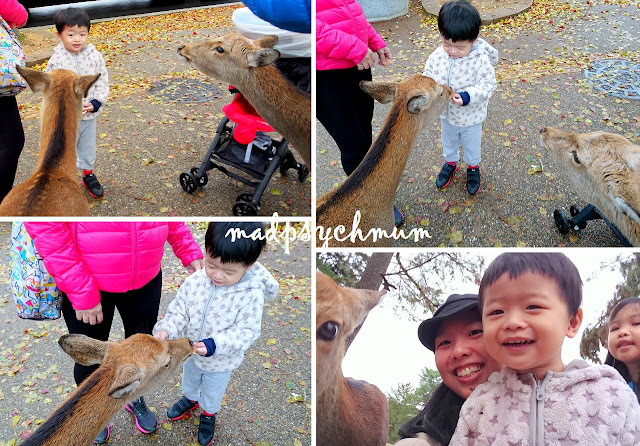 I was surprised at how much my boy adored the deer! Considering that his first encounter with one was immediately after he opened his eyes from his nap (the deer was in his face expecting food), you would think that the shock from seeing an animal in your face when you just woke up will scare you. Apparently not for my boy! He was not even fazed when the deer licked his hands. He would gaze lovingly, touch and feed them while grinning widely. He did not even react this way when we interacted with the birds and rabbits at the Animal Resort in Singapore (he was indifferent to most of the animals there). 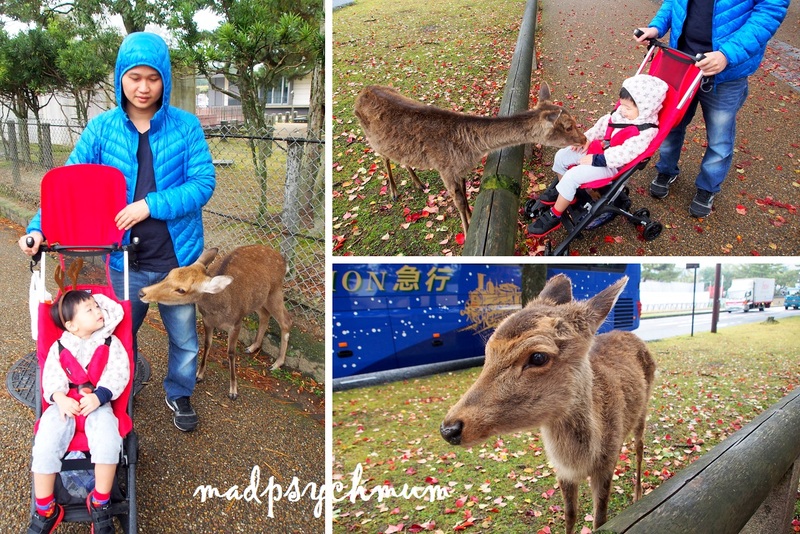 My boy interacting with the deer and enjoying it! My girl, on the other hand, was so afraid that she stayed far away and panicked whenever one would come slightly close to her. As you know, I'm a psychologist and can't let this kind of behaviour continue (work hazard *laughs*) so I employed some behavioural conditioning strategies to get her to overcome her fear. 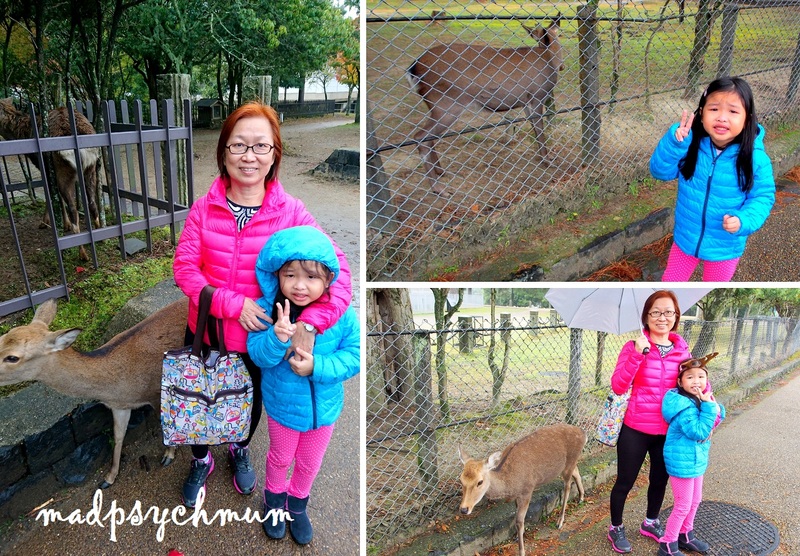 I first got her to stand near to a deer with a barrier in between (she was so scared that even this was difficult for her -_-") before progressing her steadily to standing nearer and nearer a deer. 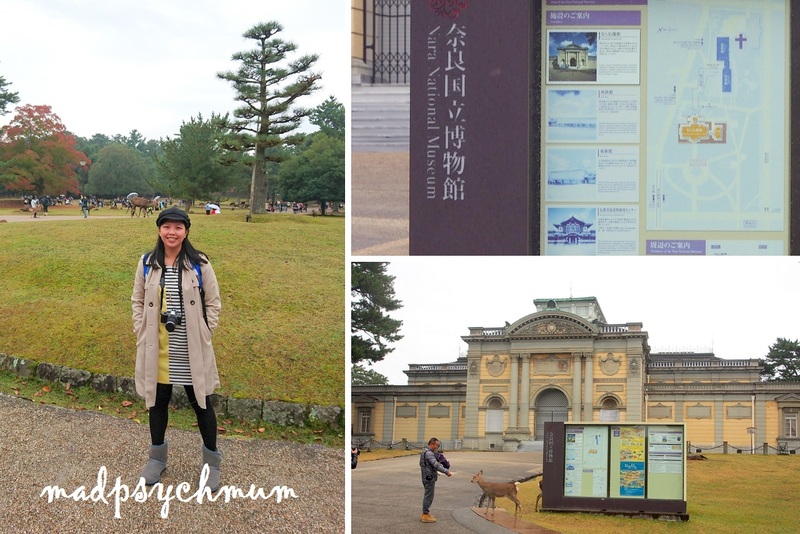 Along the road, we walked passed the Nara National Museum and stopped for a photo because the park surrounding it was very pretty! When we had finished feeding the deer all of our food, we made our way to Todai-ji Temple. Do note that it was quite a bit of walking required so be prepared with comfortable shoes. 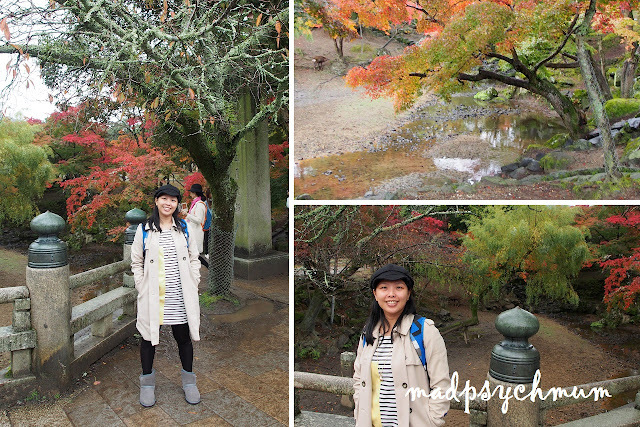 Todai-ji Temple was bustling with both tourists and locals alike! The street leading up to Nandaimon Gate was filled with people! Todai-ji is a historical monument of ancient Nara. Before we left, I made sure that my girl progressed to the final stage of overcoming her fear: feeding the deer! We decided to start her off with the smallest one. So small that it can't even fit one whole biscuit into his mouth. The deer at the temple were very aggressive (one even head-butted the hubby in an attempt to get another biscuit) so we decided to feed the friendlier ones on our way back to Nara Station. The boy was still smiling even though two deer cornered him for biscuits while the sister was standing far away (-_-). We tried to take a selfie but it wasn't successful as I did not want to get too close and scare it. Before we returned to Osaka, we walked down a street near the entrance to Nara Station in search of a ramen restaurant for lunch. 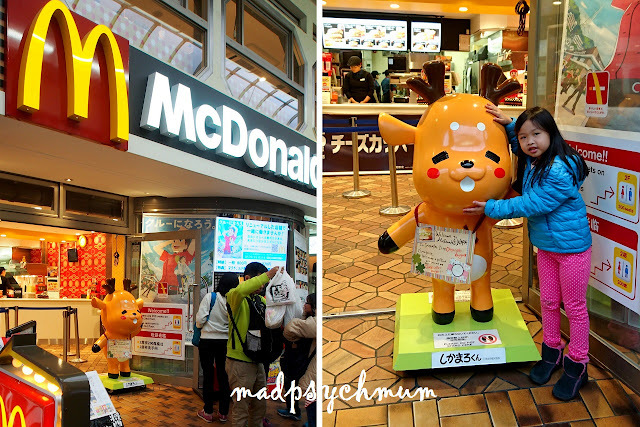 McDonald's with Nara's mascot! So cute! We found Tenkaippin, which was so popular that we had to wait about 15 minutes for a table. The signboard in case you're looking for the restaurant. 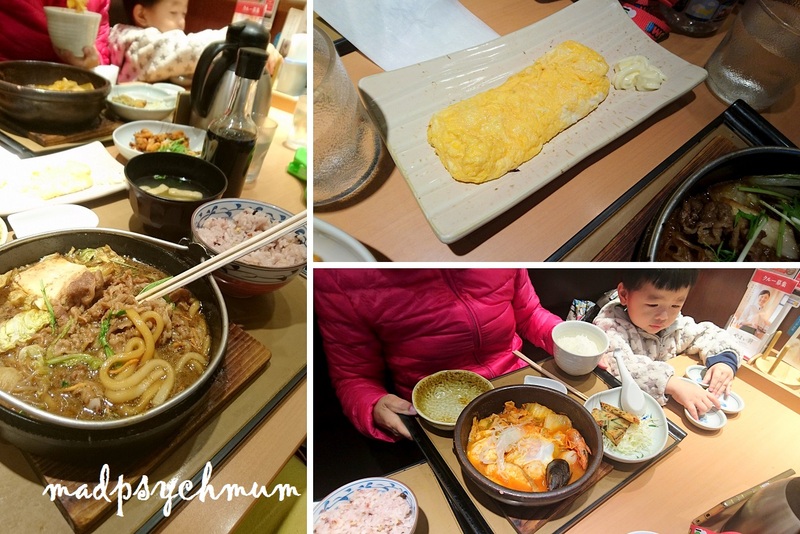 With our stomachs satisfied, we took the Kintetsu Railway back to Nippombashi where we spent the rest of the evening roaming the streets of Dotonbori again (we're here almost everyday since it's located so close to our hotel). It's like a must for me to visit Daiso in Japan even though the high exchange rate made buying stuff from there less worth it (since we can find it in Singapore). We went anyway just to see if we can find anything interesting that is not available in Singapore. 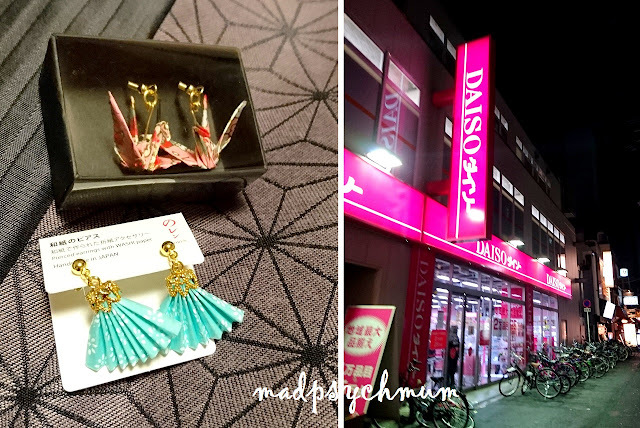 Osaka Ohsho is the one with the gigantic gyoza! Our dinner is served! Yum!